Status: Common regular breeder and spring and fall migrant statewide. Documentation: Specimens: aestiva, UNSM ZM11952, 21 May 1895 Lancaster Co; parkesi/amnicola, UNSM ZM6823, 15 May 1901, Child’s Point, Sarpy Co.
Taxonomy: This species consists of some 38 subspecies, generally divided into four groups. The Golden and Mangrove groups of 17 and 11 subspecies respectively, as well as the monotypic Galapagos Yellow Warbler, all occur south of the USA. The Northern Group contains nine subspecies as follows (Lowther et al 1999): rubiginosa, breeding in southern Alaska and coastal British Columbia, banksi breeding throughout most of central Alaska, parkesi breeding at the northern limits of the species’ distribution in northern Alaska, Northwest Territories, and northern Manitoba, amnicola, breeding south of parkesi from northwest British Columbia to Newfoundland and New Brunswick, aestiva, breeding south of amnicola and east of the Rocky Mountains from southern Alberta to Nova Scotia south to Oklahoma and North Carolina, morcomi, breeding from southern Yukon south through the interior of British Columbia through eastern Washington, eastern Oregon, eastern California east to western Montana, southern Wyoming, western Colorado, and northern Texas, brewsteri, breeding coastal Washington, Oregon, and California, sonorana, breeding in Arizona and southern New Mexico south to northeast Baja California Norte, interior Nayarit, and Zacatecas, and dugesi, breeding on the central plateau of Mexico. Thus, breeding birds in Nebraska are aestiva; this is the breeding subspecies of most of the USA east of the Rocky Mountains, including eastern Wyoming (Faulkner 2010). During migration, however, subspecies with darker plumage, noticeably on the forecrown and upperparts (Dunn and Garret 1997) may occur, including banksi, amnicola, and parkesi. Other than aestiva, only rubiginosa has been identified from Nebraska specimens; however, the four specimens we are aware of labelled rubiginosa and collected 1901-1930 are likely assignable under current understanding to amnicola or parkesi; rubiginosa is currently used for birds breeding along the Pacific coast from southern Alaska to southwestern Canada. Subspecies banksi is paler and more yellow on the forecrown. A specimen in the Brooking Collection, #2683, was taken 5 May 1920 at Inland, Clay Co; it was identified by Oberholser as rubiginosa, as were as three additional records by Brooking in the same area (Swenk 1918). There are three specimens of rubiginosa in the UNSM, including UNSM ZM6823 cited above, along with UNSM ZM6824 and ZM10760; dates of collection are 15, 30, and 11 May respectively. We believe these would now be designated amnicola or parkesi. These two northern subspecies migrate later in both spring and fall than aestiva; both are darker than aestiva (Dunn and Garrett 1997). There are rather dark specimens with dark green caps in the UNSM collection that are labeled rubiginosa (see Figure 1). The Rocky Mountain subspecies morcomi may occur as a migrant in the Panhandle; it is somewhat greener above and paler yellow below than aestiva (Dunn and Garrett 1997). Figure 1. 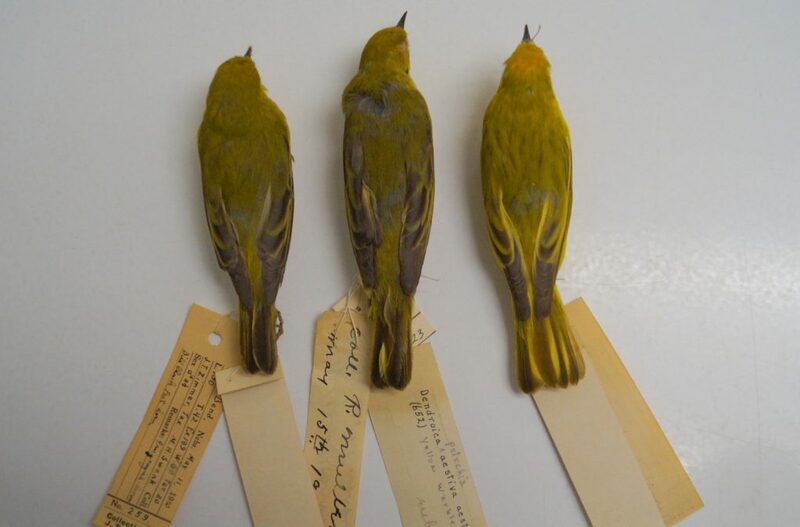 Yellow Warbler specimens from the UNSM showing variation in coloration of upperparts. The specimen on the right is a typical aestiva with yellow upperparts and yellow crown, but the specimens at center and left are darker and labeled as rubiginosa, which name has been superseded by amnicola or parkesi for breeders in the northern parts of the Yellow Warbler range that migrate through Nebraska (see Taxonomy). The darker specimens left and center are difficult to assign to either amnicola or parkesi. Left to right: UNSM10760 11 May 1910 Cass Co; UNSM6823 15 May 1901 Sarpy Co; UNSM10758 10 May 1910 Lancaster Co.
Migrants arrive in mid- to late Apr, somewhat later in the Panhandle, suggestive of the possibility that migrants there are largely northern birds of the races amnicola and parkesi or the Rocky Mountain race morcomi (see Taxonomy). There is an earlier date 12 Apr 2010 Douglas Co, and early at westerly locations were singles at McCook, Red Willow Co 21 Apr 2010 and in Custer Co 23 Apr 2010. High counts: 186 in Hall Co 11 May 2002, 140 at Wilderness Park, Lancaster Co 11 May 2018, 130 there 13 May 2006, 127 in Sarpy Co 13 May 1995, and 85 at Crescent Lake NWR, Garden Co 28 May 1995. Summer: Yellow Warblers breed commonly statewide, usually associated with willows in riparian areas. Reports are fewest in the western Sandhills and the Panhandle away from the Pine Ridge and the North Platte River Valley (eBird.org, accessed May 2018; Mollhoff 2016). BBS data show the species has increased 2.36% (95% C.I. ; 1.19, 3.43) statewide during the period 1966-2015, although finer scale analysis shows declines of >1.5% in the southeast and western Sandhills (Sauer et al 2017). High Counts: 43 along Pawnee Creek, Lincoln Co 27 Jun 2004, and 40 near Gothenburg, Dawson Co 20 Jun 2017. Departure from breeding grounds begins in mid-Jul, and migrants are generally gone by late Sep, although late dates are in Oct. Birds in Sep and later may be migrants of the darker-plumaged northern races amnicola and parkesi, as the breeding race aestiva leaves the breeding grounds early, starting in mid-Jul (Curson et al 1994); most Nebraska breeders may have departed by the end of Aug. Individuals of rubiginosa and amnicola do not arrive in Arizona until Oct (Lowther et al 1999). Rosche (1994) noted that migrants in the Lake McConaughy area are most numerous in Aug, while information in Johnsgard (1980) suggests that peak fall migration is in late Aug and early Sep. Two birds were described as “certain migrants” in Clay Co 11 Aug, based on their location. There is a very late record with details for Platte Co 17 Nov 2013, and another, without details, 6 Nov 1966 Custer Co. Two immatures wintered near Brighton, Colorado, 1997-1998 (Andrews et al 2002). High counts: 70+ at Wind Springs Ranch, Sioux Co, 25 Aug 2001, 43 at Lake Ogallala 26 Aug 2006, and 19 at Oliver Reservoir, Kimball Co 26 Aug 2000. Photograph (top) of a Yellow Warbler at Fontenelle Forest, Sarpy Co 6 May 2008 by Phil Swanson. Andrews, R., R. Righter, M. Carter, T. Leukering, and A. Banks. 2002. Birds of Barr Lake and Surrounding Areas 1888 through 1999. Ornithological Monograph No. 1, Rocky Mountain Bird Observatory, Brighton, Colorado, USA. Browning, M. R. 1994. A taxonomic review of Dendroica petechia (Yellow Warbler; Aves: Parulinae). Proceedings of the Biological Society of Washington 107: 27-51. Curson, J., D. Quinn, and D. Beadle. 1994. Warblers of the Americas. Houghton Mifflin Company, Boston, Massachusetts, USA. Dunn, J.L., and K.L. Garrett. 1997. A field guide to warblers of North America. Houghton Mifflin Company, Boston, Massachusetts, USA. Faulkner, D.W. 2010. Birds of Wyoming. Roberts and Company, Greenwood Village, Colorado, USA. Lowther, P.E., C. Celada, N.K. Klein, C.C. Rimmer, and D.A. Spector. 1999. Yellow Warbler (Setophaga petechia), version 2.0. In The Birds of North America (A. F. Poole and F. B. Gill, Editors). Cornell Lab of Ornithology, Ithaca, New York, USA. https://doi.org/10.2173/bna.454. Sauer, J.R., D.K. Niven, J.E. Hines, D.J. Ziolkowski, Jr, K.L. Pardieck, J.E. Fallon, and W.A. Link. 2017. The North American Breeding Bird Survey, Results and Analysis 1966 – 2015 (Nebraska). Version 2.07. USGS Patuxent Wildlife Research Center, Laurel, Maryland, USA. Swenk, M.H. 1918. Revisory notes on the birds of Nebraska. Wilson Bulletin 30: 112-117.